Cleans more with less effort Patent-pending dual microfiber construction has scrubbing stripes. 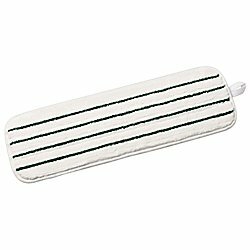 Use scrubbing stripes refills for extra cleaning power (sold separately). Mop drag is up to 10 times less - and cleans up to 3 times faster - than other flat mops. Streamlined design offers easy maneuverability.